that will tell them a little bit more, than just that you are a great shopper? While expensive gifts are nice to give and to receive, why not add a little something extra this year to let someone special that they are extra special? Probably the most valuable commodity that anyone has these days is time. Doesn't it therefore follow, that possibly the best gift of all would be a little bit of your time? Two or three hours is all that would be needed, to take a quick trip to the garden shop, pick up your materials, return home and put together a simple dish garden. The majority of this time may well be spent on choosing just the right container, accents, and plants, because the actual construction of a dish garden is really quite simple and quick. Simple enough, that even a child can easily put one together for Mom or Dad! Your dish garden should be planted in an open, shallow container. The size is only relevant to the extent of how many (or few) plants it will be able to support. It is helpful if there are drainage holes in the container, but not necessary if there is sufficient depth to facilitate adding a gravel layer for drainage. Most garden centers will have a good variety of ceramic dishes made just for this purpose. Personally, I prefer dishes with a bit more personality than the standard, round bowl "look". * Among other things, I once discovered a ten inch wheelbarrow with a set of miniature tools. Although it was made to be an ornament on it's own, this was a perfect planter for the gardener in the house. * Any basket, old or new, can be used by simply placing a non-draining container inside of it. * For the fisherman... an old fishing creel can be easily lined with plastic and planted, or used to simply cover your actual planting container. 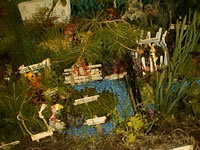 * Small logs can be hollowed out... A great home for a small fern forest. 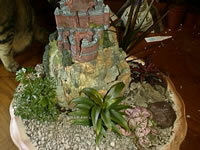 * Adobe bowls look great as "cactus scapes", when filled with small succulent plants. 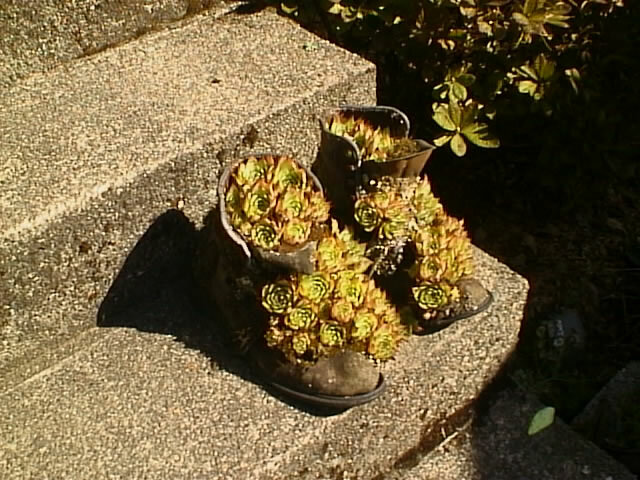 * A rusted milk can, old boot, even an old pet dish can be given a new use in life. * The ultimate dish garden, of course is a terrarium, which is easily made from old aquariums or jars. Unfortunately, because dish gardens typically have limited root space, the plants will tend to outgrow their home rather quickly. For this reason, it is a good idea to choose slow growing plants to prevent having to replace them too often. Choose plants which have the same general lighting and water requirements as your other choices. Most of the plants that are suitable as terrarium plants will work equally as well in a dish garden, but some varieties that need extra humidity may need daily misting. Most garden centers, and many grocery and discount stores will have a wide selection of small, inexpensive starter plants in 2½ inch pots. You will have no trouble choosing enough plants to finish your project. It may help to pick a couple of alternate plants to allow you more flexibility as you put together your garden. A plant which appeals to you in the store may not have the same appeal, when it is planted with your other choices. Adequate drainage is probably the most important provision to ensure the success of your dish garden. The best method of draining the excess water from the soil, is through drainage holes in the bottom of the planter. The hole(s) should be covered with a piece of broken pottery or a screen patch, to prevent the soil from washing out. This type of planter will require placing a water tight tray under the garden, to protect the table or other surfaces from water damage. In situations where there is no external drainage, you will have to cover the bottom of the container with a minimum of a one to two inch layer of pea gravel or coarse charcoal. The gravel should then be covered with a piece of nylon stocking or window screen to keep the soil from sifting down into the gravel, rendering it useless for drainage. 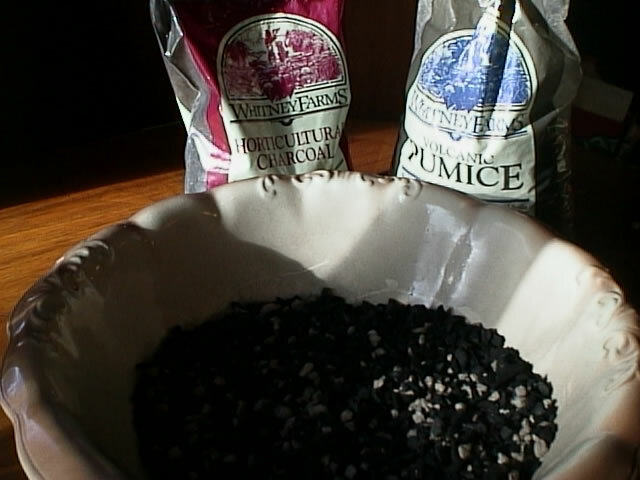 Use a good commercial potting soil, to which you have added coarse sand or perlite to aid in the drainage. Add a sufficient layer of this soil mix, so that when you set the new plants in place, their soil level will be about 1/2 inch below the rim of the planter. 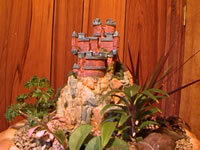 If the planter is sufficiently large, you may create different levels of terrain within your garden. Firm this soil layer lightly. 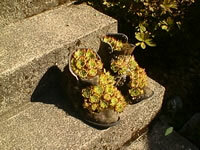 Without removing the plants from their pots, try different planting arrangements. Don't forget to consider any garden "accents" which you plan to use, during this planning stage. Arrange the plants according to how the dish garden is most likely to be viewed. As a centerpiece, for example, you would want the tallest plant in the center, so that the display would be viewable from all angles. If the garden will only be seen from one vantage point, however, you would want the tallest plants in the rear. Don't over-plant your garden for the sake of having it look immediately full. By adding fewer plants, you will have a healthier garden which will fill in quickly, and last much longer. Make sure that the plants are thoroughly watered before proceeding! Once you have your master plan worked out, you are ready to plant and landscape your dish garden. The plants can be easily removed from their pots, with their entire root structure unscathed, and ready for planting. Normally, at this point of transplanting any potted plant, you would want to lightly loosen the outer roots of the ball. 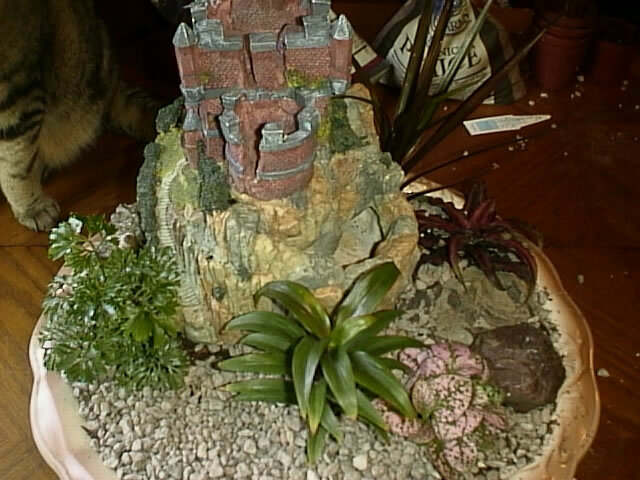 Because a slow growth rate is desired in most dish gardens, it is better to just leave the roots alone in this case. Remove the pots from two or three of your plants at a time, beginning with the tallest plants first. 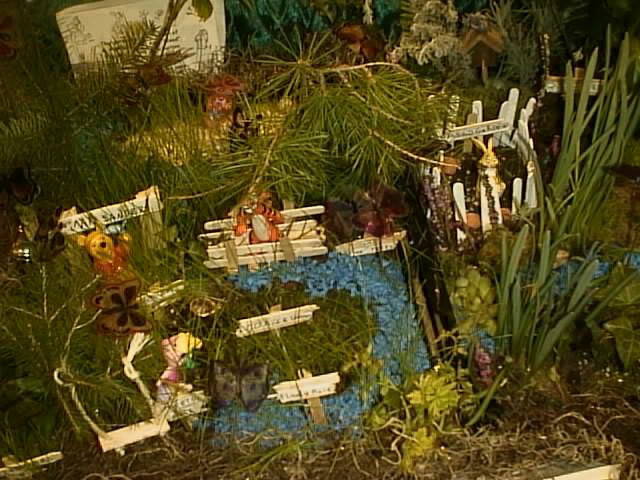 Set these plants into position, making any final adjustments as to where they will "face". Fill in around each plant with fresh planting mix, and then continue with this process until all of the plants are in place. Add more soil as needed to fill in areas. Pack the soil gently, and water it lightly. Your dish garden should be kept in a spot where it will receive the correct amount of light for the chosen plants. "Full sun" type dish gardens should be gradually adjusted to their permanent window area to prevent sun burn. Place them in bright, indirect light first. Each day, for a week, move them closer, until they are in the "full sun" spot. Allow the soil in your dish garden to become nearly dry, before you add a small amount of water again (start with a cup or so...). Never allow the soil to become too dry, or too soggy. Experience will quickly teach you how much, and how often to water. Generally you will not have to fertilize your dish garden. The plants will seldom be in place long enough to deplete the nutrients from their soil, before they are moved on to a bigger planter. Of course, if the plants have been in the same soil for too long you can feed them, but use a VERY dilute 1/4 strength liquid house plant food. With a little care, your dish garden will become an ornament for your home, and a living memory. 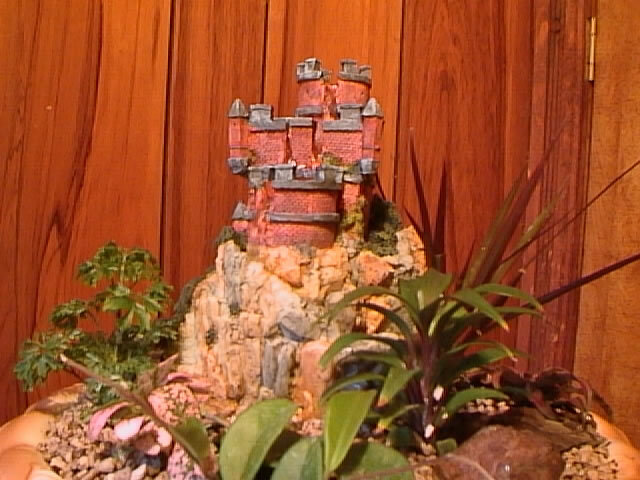 It is hard to see it in the photos, but there is a small waterfall that falls from the castle turrets then follows a stream through the plants to a reservoir in the bowl.